After reviewing Transformers: War for Cybertron, I wasn't going to bother writing about Transformers: Cybertron Adventures, as I figured it would be more or less the same game with downgraded graphics and remote-supported aiming. It's a testament to how little promotion Activision has done of this Wii version, then, that I was shocked to discover a completely different game. With all new story elements and radically different gameplay, Cybertron Adventures is actually worth talking about. If you have a Wii and can't get enough of Transformers, it might actually be worth buying as well. 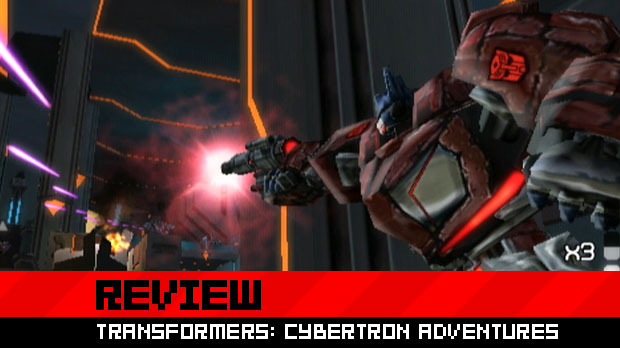 Read on for the full review of Transformers: Cybertron Adventures. While War for Cybertron is third-person-shooter with free movement and the ability to transform at any time, Cybertron Adventures takes the form of an on-rails arcade shooter with compulsory vehicular sections strewn throughout each level. 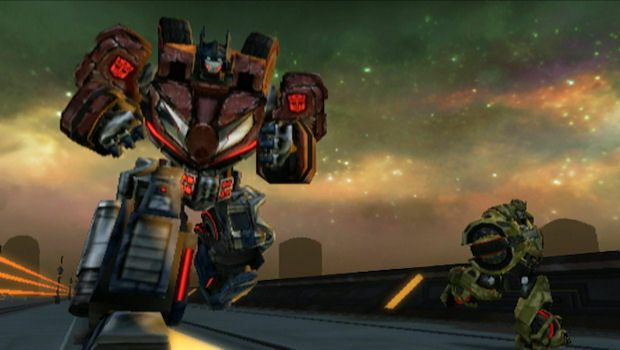 Players have no control over the movement of the Transformer in robot mode, except for the fact that they can choose when to take cover from enemy fire. As a robot, players are simply concerned with aiming and shooting. It certainly came as a shock to me, but it's actually not that bad at all. Each character gets four weapons -- a sniper rifle, a gatling gun, a missile launcher and a useless weapon that will either be a cannon or a blaster. The game is all about popping in and out of cover to take on hordes of enemy Transformers and score points. It's quite simple, and the challenge is relatively easy going on normal difficulty, although the occasional boss fight or timed objective can through up some stiffer opposition. 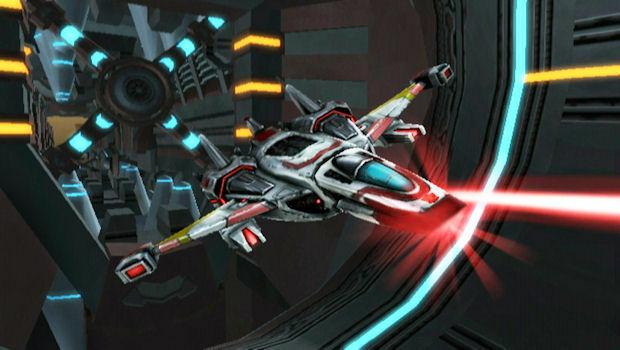 At certain points in each level, the player will be forced to take a vehicle form in order to race to another section. Sometimes there's a time limit, but the general idea is very much the same as the robot sections -- shoot everything and score as many points as possible. Vehicles can lock onto opponents with missiles or shoot ahead with a machine gun. Again, players have no choice when to become a vehicle, although there's a lot more direct control in these sections. The robot sections are arguably the stronger of the two elements, with decent controls and even a unique attempt to put stealth into an on-rails shooter. The vehicle sections are alright, but the controls are a little unwieldy and the vehicles can be rather slow, especially the disappointingly sluggish jets. Even worse is the fact that if a car flips upside down, it's game over. Yes, these are cars that can turn into robots at any time, yet apparently they get stuck like beetles if their wheels are in the air. Makes no sense, and it's a little weird that the cars have no real weight to them in the first place. The most impressive element of Cybertron Adventures, however, is the story. 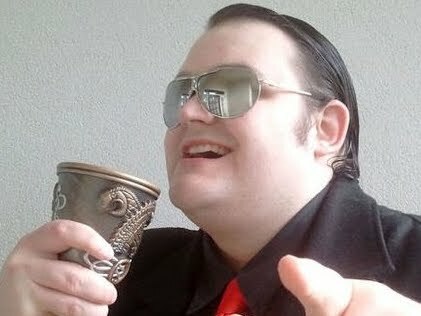 High Moon Studios promised a lot of interesting narrative in War for Cybertron but didn't really deliver. Apparently it was all hiding in Cybertron Adventures. 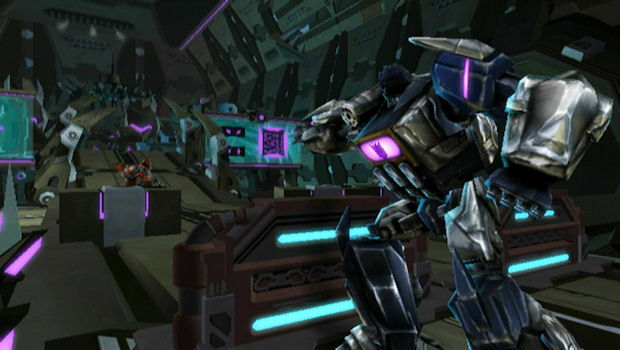 Megatron and Starscream have a much more interesting set of altercations in the Wii version, and many characters like Thundercracker and Ironhide get a lot more of a spotlight, with their own levels and dialog that more greatly reflects their personalities. The fact that Cybertron Adventures features a "Starscream goes for Megatron, gets smacked down and begs for his life" moment is enough to give it a narrative edge over its bigger brother. Overall, it's a very solid game, although it can get quite repetitive. None of the characters really have any variety to their weapons and the vehicles aren't all that different either. The action itself is rather fun and there's co-op and special challenge modes to keep things interesting, but it's not a game you could play for hours and hours on end. It also looks really grim compared to War for Cybertron. It may be unfair to compare a Wii game to a PS3/Xbox 360 game, but if you're playing this as a supplement to the main game, the difference is scorching to the eyes. Not to mention the fact that Wii games can and do look better than this rather murky title. Ultimately though, Cybertron Adventures is surprisingly good. It's definitely not as great in the gameplay department as War for Cybertron, with a lot less to do and a far more restricted format, but its superior narrative and decent arcade action is at least enough to make it worth picking up on its own. If you loved War for Cybertron and want some more Transformers fun, then this you won't go far wrong in picking it up. Likewise, if all you own is a Wii but you want to get your Optimus on, then this will at least give you a nice little fix of your favorite robots in disguise.